Anne and I toured Chicago’s historic Fine Arts Building today and came across room number 917, the first home of The Little Review, from 1914 until 1917. 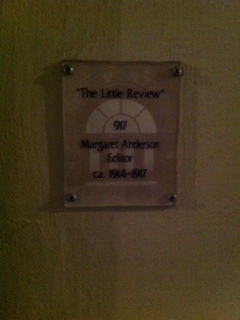 Margaret Anderson was the founder and editor of The Little Review , a highly influential literary magazine that published, early on in their careers, notables such as James Joyce, Ezra Pond and Carl Sandburg, just to name a few. Margaret Anderson was one of two grande dames of the Chicago Literary Renaissance that took place in the first two decades of the 20th century (the other being Harriet Monroe, founder of Poetry magazine). Interestingly, Ms. Monroe also, at one time, had an office in the Fine Arts Building. Ms. Anderson will be inducted into the Chicago Literary Hall of Fame this coming December 6th, at a ceremony in Roosevelt University’s magnificent Ganz Hall. To find out more about the ceremony go to chicagoliteraryhof.org. The Chicago Literary Hall of Fame Induction Ceremony is approaching, and the program lineup is outstanding. Thomas Dyja, the author of The Third Coast will be presenting for Ben Hecht. There will will be a rendition of one of his 1001 Afternoons in Chicago performed by Strawdog Theater and Contemporary Music. Sculptor Richard Hunt will be presenting for Leon Forrest and Marco the Poet will be performing from Forrest’s novel, Divine Days. Author Rosellen Brown presents for Edna Ferber, while diva Lynne Jordan performs a song from Showboat. Ms. Jordan will also perform for honoree John H. Johnson. Young adult author Blue Balliett is presenting for L. Frank Baum, while actor David Eigenberg from the TV show, Chicago Fire, does a reading from The Wonderful Wizard of Oz. Bob Baum will accept for his great grandfather. Penelope Niven presents Thornton Wilder, while Joe Meno does a reading from Wilder. Wilder’s nephew, Tappan Wilder will accept for his uncle.